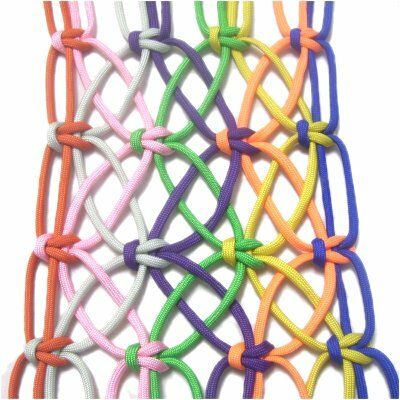 Description: Locking Patterns were often used in the past to make Macrame hammocks and nets. 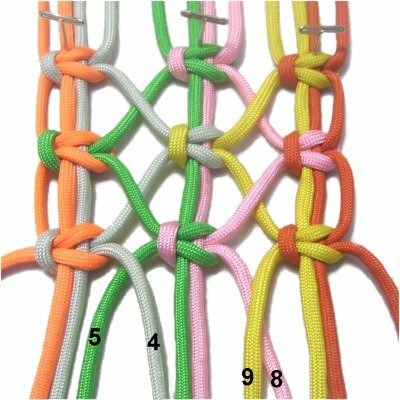 I found these three Square Knot designs in a book written in 1903, so they are considered vintage techniques. These unique interlocked patterns are used to form panels with straight edges, and large spaces between the rows (open weave). 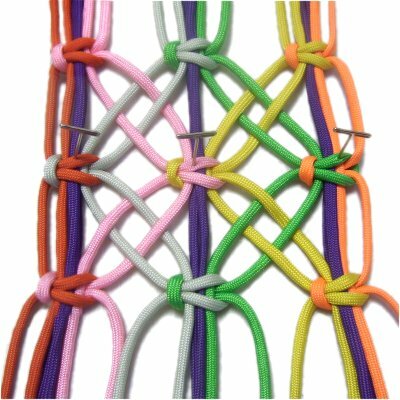 The crossed elements of these designs makes the open weave more secure. Only a limited number of cords were used in the examples, but you can make them as large as you wish. 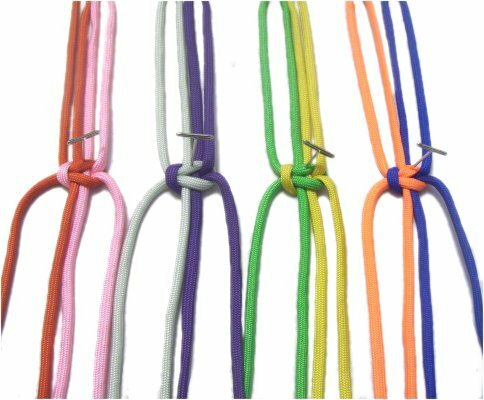 Make sure you know how to tie Square Knots. The Straight Lock is the easiest pattern. It's not as busy as the other two designs. The Daisy Lock is also called the Crazy Daisy (seriously). The names comes from the petal-like designs formed by the crossed elements. The Cross Lock features a crisscross pattern similar to the Daisy Lock. But there are fewer filler cords, which makes it more flexible. The Straight Lock is the most popular of the Locking Patterns on this page. You can use it to make items like belts and bracelets. Focus on the two working cords coming from the center group, because those are the ones you will use to form the crossed elements. Step 1: You need six 2-yard cords folded in half and secured at the top of your board. Arrange them into 3 separate groups of 4, and place them at least 1-inch apart. Mentally number the cords as shown. Designer's Tip: Locking Patterns need to have straight horizontal rows of Square Knots. Tie one Square knot, then apply a piece of tape above it, arranged across all the cords horizontally. When you tie the next two knots, tighten them so they rest against the lower edge of the tape. 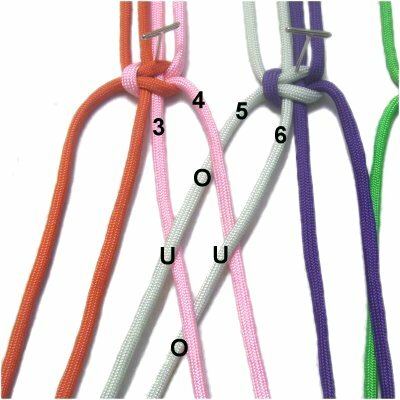 Step 2: Tie 1 Square Knot with each group of 4 cords. Make sure they line up horizontally. 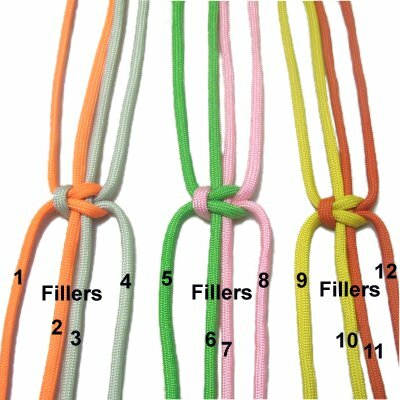 Identify the fillers for each set of cords and place them close together. Working cords 4,5, 8, and 9 will be crossed in the next step. Important: The over - under sequence of all Locking Patterns is an essential part of the design, so pay close attention to the following steps. Step 3: From the center group, pass cord 5 under cord 4, moving it to the left next to filler cord 3. Pass cord 8 under cord 9, and move it to the right next to filler cord 10. Cords 4 and 9 should rest next to filler cords 6 and 7, in the center. Designer's Tip: It's important to keep the edges straight in Locking Patterns. ALWAYS tie the knots starting from the middle of the panel, working outward in both directions. 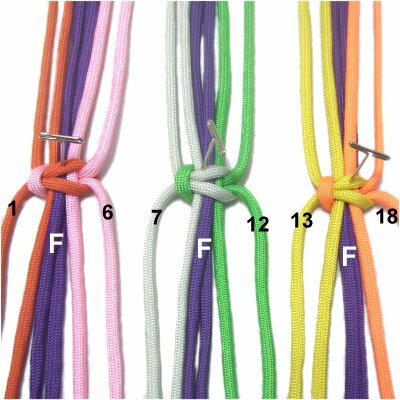 After the three knots are tied, check to make sure the right and left edges are straight (vertically). Loosen the knots and move them forward slightly, if that will help straighten the edges. Step 4: Move the two working cords in the center group again, passing cord 4 under cord 5. Pass cord 9 under cord 8. Check the edges to make sure they are straight. Measure to make sure the three rows are the same distance from each other. Step 5: Repeat step 3 to make the 4th row of SK. Important: The direction of the crossings for all three Locking Patterns must be made as described, or the knots won't "lock" together. For this design, just remember that the 2 working cords from the center group should ALWAYS rest under those coming from the left and right groups. Locking Patterns can have interesting names. This one is called the Crazy Daisy, because the crossed elements resemble the petals of a flower (pink and yellow design in the image above). 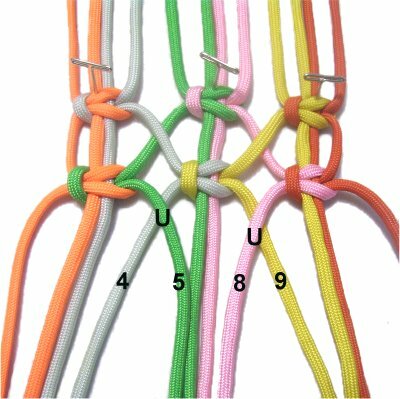 It takes three rows of SK and three groups of cords to make one "daisy", which is what is described below. When arranging the cords in step 1, the second cord in each group should be the same color (purple cords in images). What makes the Daisy Lock different from the Cross Lock (next design) is that there are additional filler cords. These remain vertical, which stabilizes the panel, and doesn't allow it to stretch as much. Step 1: Secure 9 cords to your board, after folding them in half. Arrange them into three groups that rest at least 1.5 inches apart. Mentally number the cords 1 - 16. 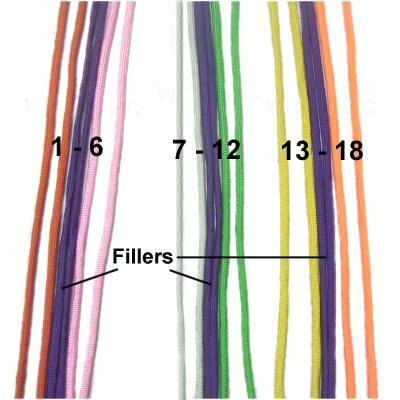 In the images, the dark purple cords are the fillers in each group, and you add two others when tying the SK, for a total of 4 fillers per knot. Prior to tying each row, identify the working cords (WC), as well as the four fillers. Make sure they rest close together, so each group is separated. 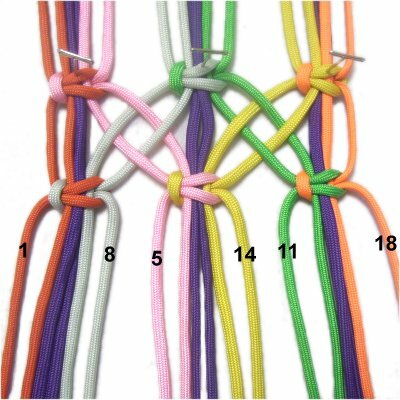 The working cords for the first SK are 1 and 6. For the second SK, the working cords are 7 and 12. Use cords 13 and 18 as working cords for the third SK. Designer's Tip: Keeping track of the mental numbering in Locking Patterns can be challenging. You can apply tape to label the cords that are being crossed, and write their numbers on the tape. Step 3: Move cords 7 - 8 and 13 - 14 slightly to the left. Cross cord 6 over - under cords 7 and 8. 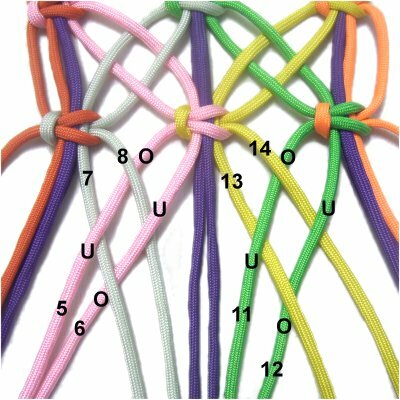 Cord 5 should be crossed under - over cords 7 and 8. Cross cord 12 over - under cords 13 and 14. 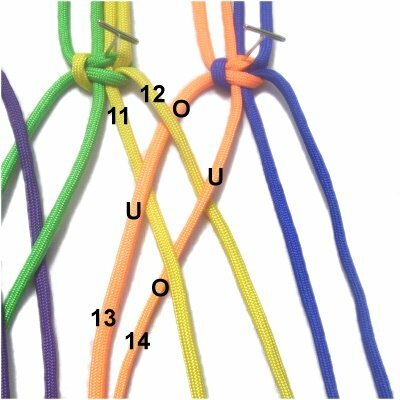 Cord 11 should cross under - over cords 13 and 14. Step 4: The SK in the center is tied first. The working cords are 5 and 14. The fillers are 6, 9, 10 and 13. There should be at least 1.5-inch of space between this knot and the previous one. 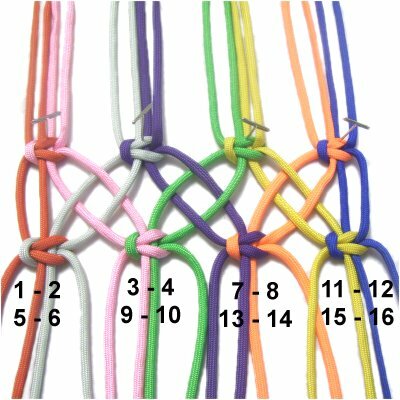 Step 4, continued: Tie the SK on the left with 1 - 4 + 7 and 8. 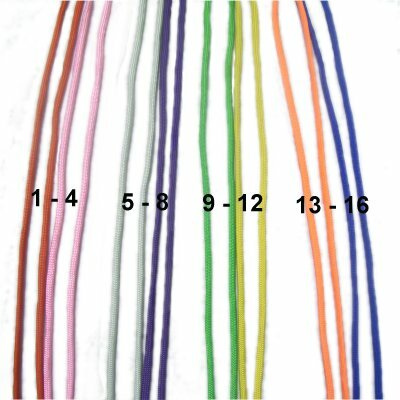 The working cords are 1 and 8, and the rest are the fillers. Tie the SK on the right with 11 and 12 + 15 - 18. The working cords are 11 and 18, and the rest are fillers. Designer's Tip: Locking Patterns look best if the crossed cords are slightly taut. 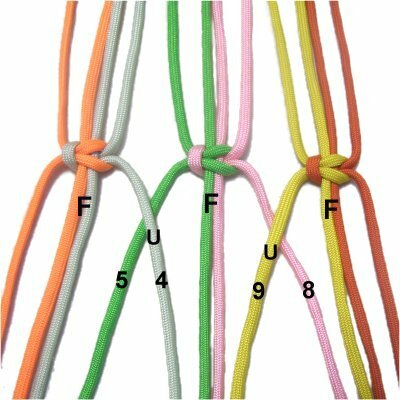 Secure the knots in one row prior to tying the next. This will help keep the edges straight. Step 5: Move cords 5 - 6 and 11 - 12 slightly to the left. Cross cord 8 over - under cords 5 and 6. Cross cord 7 under - over cords 5 and 6. Cross cord 14 over - under cords 11 and 12. 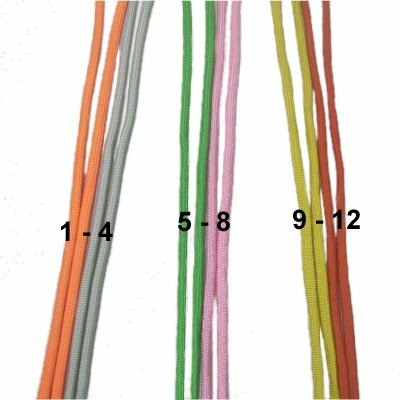 Cord 13 should cross under - over cords 11 and 12. Designer's Tip: Locking Patterns always return to the original groups every other row. 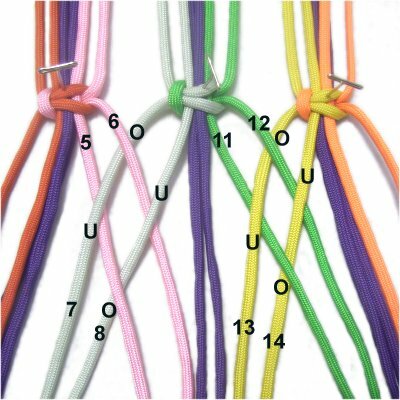 Center SK: The working cords are 7 and 12. SK on left: The working cords are 1 and 6. SK on right: The working cords are 13 and 18. Step 6, continued: Make sure the edges are straight, as well as the filler cords. The distance between the rows should be the same. Repeat steps 3 - 6 again, if you have enough material. Locking Patterns can look very similar to each other. The Cross Lock pattern looks like the Daisy Lock, but it doesn't have the extra filler cords. This design can be expanded side to side, which is why it's been used to make fishing nets and similar items. The main challenge in this design is to keep track of the numbering. For that reason, I suggest you apply tape to each cord, with the numbers written on each piece. Step 1: Secure eight 2-yard cords to the top of your board, after folding them in half. 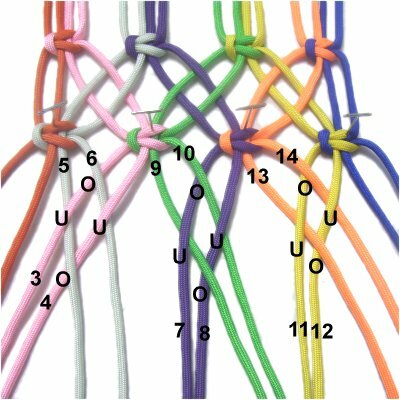 Arrange them into 4 groups of four cords each, and mentally number them 1 - 16. 2017 Update: The information for this design has been changed, to make it easier to understand. Secure the knots to your board. Step 3: Move cords 5 and 6 (2nd SK) slightly to the left as shown. Cross cord 4 over - under cords 5 and 6, as you move it to the right. Cross cord 3 under - over cords 5 and 6, also heading right. Step 4: Move cords 9 and 10 (3rd SK) to the left. Cross cord 8 over - under cords 9 and 10, as you move it right. Cross cord 7 under - over cords 9 and 10. Step 5: Move cords 13 and 14 to the left. Cross cord 12 over - under cords 13 and 14. Cross cord 11 under-over cords 13 and 14. Step 6: Tie the second row of SK, tightening each one at least 1.5 inches from the first row. Make sure you keep the edges straight, and secure the knots. Move cords 3 and 4 to the left. Cross cord 6 over - under cords 3 and 4. Cross cord 5 under - over cords 3 and 4. Move cords 7 and 8 to the left. Move cords 11 and 12 to the left. Cross cord 14 over - under cords 11 and 12. Cross cord 13 under - over cords 11 and 12. 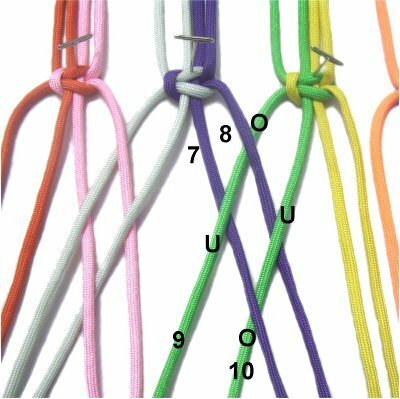 Secure these knots if you plan to tie another row. 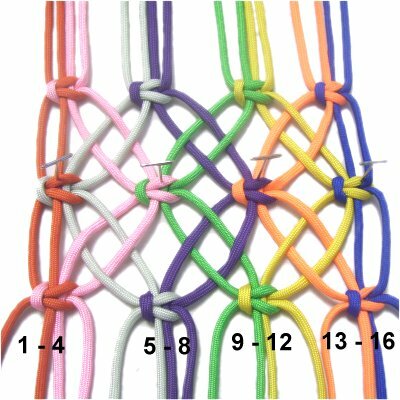 Step 9: Repeat steps 3 - 6 to tie row 4, if you wish to continue. Locking Patterns look better if they have multiple rows. 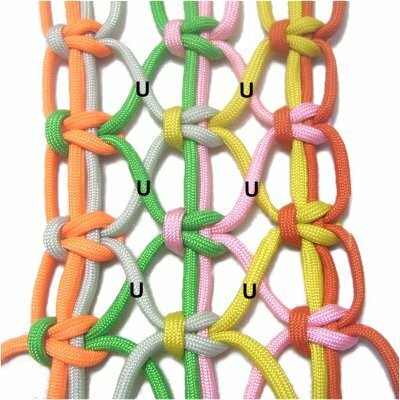 Have any comments about the Locking Patterns? Contact Me.